Providing access to palliative care to all cancer related illness. The Care for Cancer Foundation is a non-profit organisation that aims to share the burden of cancer by improving patient access to innovative cancer care. Cancer is a burden that impacts on the lives of all South Africans, across all languages, races, ages, genders and religions. Cancer, in its various forms, is currently the fourth biggest killer of South Africans. This is despite the fact that most common cancers can be successfully treated if detected early enough. The most common obstacles to successful treatment are money and resources - many South Africans are unable to afford cancer treatments, or don't have access to adequate cancer treatment centres. Our vision is simple: To share the burden in the fight against cancer. We aim to alleviate the state health care providers' burden of refurbishing and upgrading oncology units and treatment centres and improving oncology nursing skills. We aim to share the patients' financial burden by giving them access to the drugs and facilities they need. We aim to share the health care providers' burden of the treatment decision, often based on the 'cost to treat' rather than the effectiveness of treatment. Our goal is to allow for the most appropriate treatment to be given and mitigate the treatment choice being primarily a financial decision. We aim to share the burden of the medical aid scheme by reducing the funding risk and facilitating patient access to innovative cancer care. We aim to share the pharmaceutical companies' burden of patient access to innovative and effective medication. By 2030, there will be a projected 23.6 million cancer cases around the world. Most of these will occur in low- and middle-countries that are unable to offer proper treatment and care. Dr. Gilberto Lopes, a Professor of Oncology at John Hopkins University, Chief Medical and Scientific Officer for the Oncoclinicas Group in Brazil, and member of the Strategic Innovation Advisory Board, shares his insight on the vital need for cancer treatment is in low- and middle-income countries. 1Taken from “Developing Resource-Stratified Guidelines in Oncology to Improve Cancer Care Worldwide” by Dr. Gilberto Lopes. 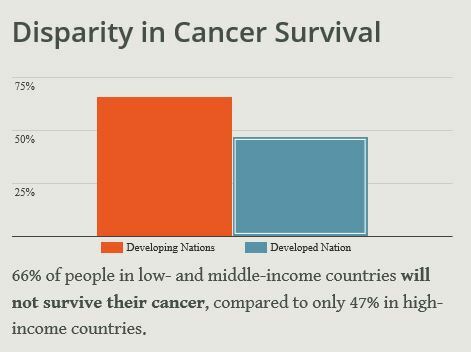 Read the article to learn more about the needs around cancer control in low- and middle-income countries to better understand how it drives our mission.